IAF fighter jets attack Hamas target in central Gaza in response to explosive device that was detonated near the border. 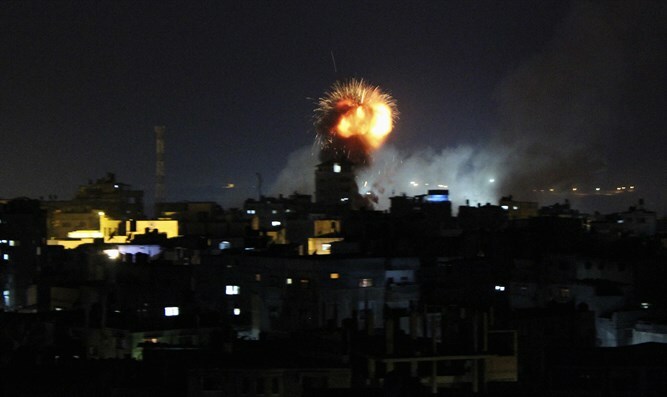 IAF fighter jets on Saturday night attacked a Hamas terror target in central Gaza. The IDF Spokesperson’s Unit said the air strike was in response to the explosive device that went off adjacent to the security fence earlier in the day. “The IDF will continue to operate for the safety of Israeli civilians, by all means at its disposal. The Hamas terror organization is held accountable for all occurrences in and from the Gaza Strip,” it said. No one was injured and no damage was caused by the explosion near the border. On Thursday morning, IDF forces neutralized an explosive device placed near the Gaza-Israel border. The device had been placed during a protest march, and was wrapped in a Palestinian Authority flag. The protest marches, noisy and disorganized, are often used as an opportune cover for planting bombs. Last month a hidden roadside bomb was detonated near soldiers from the Golani Brigade as they were attempting to take down a flag that was affixed to the border fence. Four soldiers were wounded by the blast, two seriously.